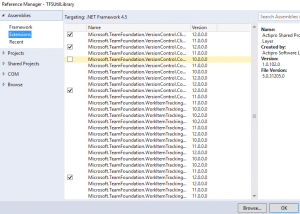 Additional information: Method not found: ‘Void Microsoft.TeamFoundation.WorkItemTracking.Client.WorkItemStore..ctor(Microsoft.TeamFoundation.Client.TfsTeamProjectCollection)’. Bizarrely, I was following my own blog post to create a test case, reading tags from the system. This threw me for some time. I had a good idea it was caused by the wrong version of the Work Item Tracking extension library. Installing this magically sorted the issue for me. 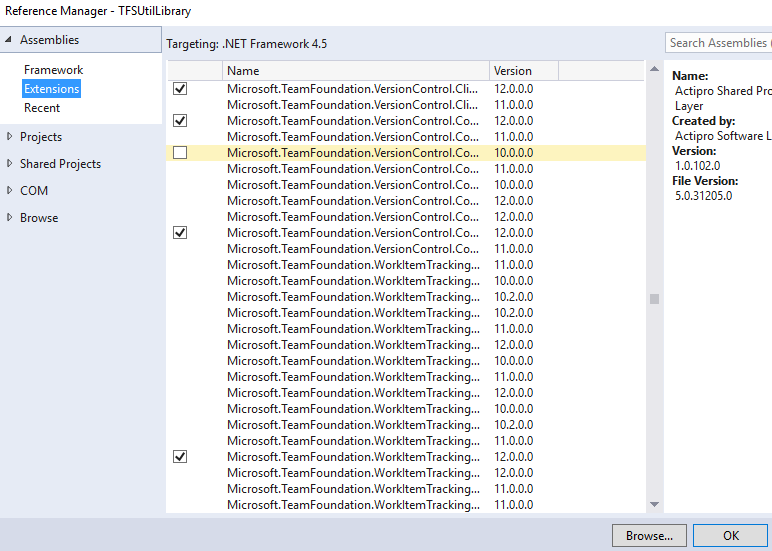 This entry was posted in C#, TFS and tagged Exception thrown: 'System.MissingMethodException' in, Method not found: 'Void Microsoft.TeamFoundation.WorkItemTracking.Client.WorkItemStore..ctor(Microsoft.TeamFoundation.Client.TfsTeamProjectCollection), TFS, TFS 2015, TFS On Premise, WorkItemCollection, WorkItemStore, WorkItemTracking on January 7, 2017 by pcmichaels. // Create the work item. // Save the new work item. Obviously, we’re not writing a new front end for TFS here, but the basics are there. The first part of the function gets the relevant fields; once the .Validate() has been called, then we have a look at the result. If there are no errors then just save; otherwise, we try and work out what they were. This entry was posted in C#, TFS and tagged TeamProject, TeamProjectCollection, TFS, TFS API, TfsTeamProjectCollectionFactory, TPC, WorkItemTracking on November 23, 2016 by pcmichaels.